This is something I had never heard of before this pregnancy (my third). 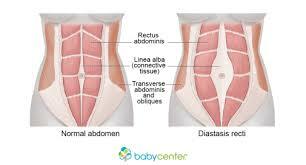 Diastasis Recti is a condition when the muscles of the abdomen separate, the rectus abdominis (six pack), separate. This usually occurs during pregnancy, however, it can occur because of other conditions. It’s what causes the classic “mamma pouch.” approximately 44% of women have it even at 6 months post partum and 33% at 12 months post partum. This separation occurs to make more room for your growing uterus, which is exerting pressure on your abdominal wall causing the muscles to bulge forward. It’s not a tear, but a stretching of the linea alba, aka the connective tissue that runs vertically along the midline of your abdominal wall. Diastasis Recti can cause serious health problems if the separation is large. Most women do not suffer from a large separation. It can cause back pain, pelvic pain, and basically you don’t have anything protecting your organs. It’s fairly easy to check yourself for a larger than normal separation between the abdominal muscles. Here is a video . How to check for it: lay on your back with your knees bent like your going to do a bridge. Then pull your pelvic floor up and lift your head and shoulders like your doing a crunch. In this position place your fingers on your belly button and move straight up in a line feeling for the separation go three inches above and three inches below the belly button. If the separation is more than one finger widths you have Diastasis Recti. If it’s three fingers you should see a physical therapist. Standing inner thigh lift: lift one leg with a slight 45 degree bend in your leg and then move your foot in and up. Tricep kickbacks: bend over at the waist and move your arms from 90 degrees to straight. You can use light weights if you have them. Perform 2-3 sets with 10-12 reps 3-4 times a week. You should see improvement in 8-12 weeks. If you don’t, consider seeing a physical therapist. As always check with your doctor before beginning this program. Exercises you should avoid are the ones which cause your abdominal muscles to push out (a sure sign that you’re increasing the abdominal pressure). Also any exercises which you cannot perform without arching your lower back off the floor. These include push-ups, front planks, sit-ups, crunches (anything that has you raise your shoulders and head off the floor), and leg lowers (either seated or laying on your back). As you recover from pregnancy and child birth, keep in mind that it took nine months to get your body into the shape it’s in and it’s going to take some time to get back to your pre-pregnancy shape. Be patient and be kind. Running Preggers: The Weight of It. Pregnancy and weight gain go hand and hand obviously. The recommendation for women who are of average weight, BMI of about 18-24%, is to gain between 25-35 lbs during their pregnancy. There are few women, or men, who want to gain an extra 25 lbs. During pregnancy gaining too much or too little has health consequences for both mother and baby. There’s a certain level of anxiety about gaining weight during pregnancy and the ability to loose it afterward. We all have friends or relatives who never lost the “baby weight” and if they get pregnant again, they put on more weight. You’re not going to loose all that weight the moment baby is born. Some of it is fat that you’ll slowly work off over the months that follow the birth of your little one. How much fat? Stored fat for delivery and breastfeeding: 5-9 lbs. So you’re looking at losing somewhere between 12-14 lbs right at birth. Your blood volume will return to normal over the six weeks following birth and your uterus will shrink down over the same period of time. That’s another 6-9 lbs. That leaves you with breast tissue and your store of fat. If you are planning to breastfeed your baby, you’ll add some weight when your milk comes in (2-3 days after birth of baby), which shouldn’t surprise anyone who has picked up a quart of milk. The average milk capacity of a human female is between 25-35 oz a day. Breastfeeding burns an extra 600-800 calories a day (you should be eating 500 extra calories to maintain your milk supply), which means merely feeding your baby will help you burn of some of that fat store. You’ll still be wearing your maternity clothes for a while after baby is born, so don’t pack your skinny jeans in your hospital bag as you prepare for the birth of your baby. The important thing is to know this is normal and not to be concerned about it. Your body just created a whole other person inside of it which took nine months. You should give it the same amount of time to lose the weight. Lugging around an extra 25 lbs is hard work and since it’s not all fat stores, I like to think we’re getting stronger in the process. Losing weight can be a slow process after baby is born because it’s harder to get to the gym or hit the trails for a run, not only because you have a little one to care for, but because you’re tired. But it’s doable. Give your body time to recover from the most important endurance event in your life. Remember how great it feels to pull in the fresh air of the mountains until your ribs are at their limit and then to let it out slow just because you can and your lung capacity is impressive as a runner. Well, if you’re in your third trimester of pregnancy (28-40 weeks), you’re missing that ability and those impressive lungs. Having reached the third trimester, you can see the finish line (even if you’re not ready for it) and you’ll be able to realize those breathing dreams once again and even baby will be expanding their lungs as yours reclaim their glory. The hormone progesterone stimulates your respiratory center in your brain so the air your breath in stays in your lungs longer allowing you to get as much oxygen out of it as you can. There are a few things you can do to help with this feeling of being out of breath all the time. First, good posture. Make sure your sitting and standing straight. If your hunched over when sitting it’s going to compress your diaphragm and lungs more (and it may keep baby turned sunny side up which is not the optimal position for birth). Second, keep running and/or exercising. You may have to slow down to compensate for your cramped internal organs. Pregnancy isn’t the time to hit a new personal record anyway. Mostly you want to maintain your fitness level or lose as little as possible. Yoga also helps with it’s use of the breath during poses and it’s breathing exercises. Third, relax and don’t over do it. Being hyper-vigilant about your breathing is only going to make things worse. Take time to relax each day even if it’s only for ten minutes. Fourth, if your having trouble with breathing because of congestion try using a humidifier at night. Exercise will also help break up the mucus. Take heart, your baby is almost ready to be held in your arms rather than in your belly. As baby gets into position to be born, she will drop into your pelvis and you may find it’s easier to breath. This is also called lightening. It usually happens two to four weeks before delivery. If this is not your first child, baby may not drop until right before delivery. As nice as this lightening is on your lungs and diaphragm, it’s not so great for your bladder. Weekly Miles: My running is very inconsistent at this point. I run on days I feel good and it’s comfortable to run. Other days, baby’s position makes it very uncomfortable. I don’t really track miles. I’m just happy when I’m able to do a little run. Thirty-eight weeks and counting. Popping veins may be every body builders dream, but as a pregnant runner it’s not something you show your friends with joy and enthusiasm. It’s more along the lines of shock and horror. Varicose veins are another one of those lovely pregnancy symptoms. Not all pregnant women have to deal with them. Varicose veins appear during pregnancy because your blood volume increases and at the same time the rate at which blood flows from your legs to your pelvis decreases. This increases the pressure on the veins in your lower body and can cause them to become enlarged. Another contributor to varicose veins is the increase in progestin levels, which dilates veins. The pressure of the uterus on the inferior vena cava, the vein that carries blood from the legs and feet to the heart also adds to the possibility of having vericose veins. There are a few things you can do to minimize and/or prevent varicose veins during pregnancy. First don’t sit or stand too long. Changing position is your first line of attack. Next is don’t wear high heels (none of you wear them anyway because your runners, right?). Wearing high heels weakens your calf and can shorten (through tightening) your Achilles tendon. Third, wear compression socks or sleeves on your calves or you can go full out and get maternity support hosiery. Fourth, don’t cross your legs (like you could if you wanted too) during pregnancy. Fifth, elevate your legs every so often to improve circulation. Sixth, sleep on your left side. This takes the pressure off of the inferior vena cava I mentioned earlier. Finally, exercise. Specifically, running and/or walking. The idea is to have strong calf muscles which promotes good blood flow in the lower legs. Other than these suggestions, there isn’t much you can do about the vein popping while your pregnant. Varicose veins that appear during pregnancy typically go away within three to twelve months after baby is born. But if they don’t, you’ll be joining the ranks of 1/4th adults in the U.S. who develop them during their life time. When they don’t go away what’s happened is the small valves within the veins that prevent blood from getting backed up are not working like they should and the blood pools and increases the pressure in the veins. The body then tries to widen the veins to compensate and they end up bulging and thickening. Varicose veins that don’t go away after pregnancy or that you develop outside of pregnancy should be monitored by a doctor. They can cause achiness, heaviness, throbbing, cramping and swelling in the legs. They are treatable and seeing someone about them sooner is better since they can indicate a more complicated issue. How many carbs do I burn when running? Carbohydrates are one source of fuel our bodies use to provide energy for our daily activities and for our runs. Fat is the other source of fuel our bodies use. Carbohydrates have to be replaced during training and racing, but fats don’t. How much and how quickly we burn through carbohydrates and fats depends on a variety of factors. Understanding how many calories we burn and where it comes from can help us dial in our nutrition plan for race day and for training. When we run fast and for shorter distances we burn mostly carbohydrates. As our distance increases and our pace decreases we begin to use fat as a fuel source too. We begin to use fat at slower long distance events because we have a lot of energy stored up in fat, even very thin people. Fat takes more oxygen to burn so if you’re running hard, it’s not a good source of energy. Fat also takes longer to burn, so if you’re running fast, it’s not a good source. If you’re running a 5k-half marathon, you’re tapping into your carbohydrate stores and burning very little fat. This is the core of the belief that endurance athletes can perform well on a low carbohydrate diet. The problem comes when the same athlete tries to push hard and go fast. I raced and trained on a low carbohydrate diet for 18 months and was fine, unless I wanted to push my limits and then…I died. Despite being low carb (under 50 g a day), my body still could not burn fat fast enough to sustain hard effort. So I switched back to a higher carbohydrate diet. One way to figure out the ratio of carb to fat that you are burning is to use your heart rate. To do this you need to know what your maximum heart rate is (220- your age. This is a guestimate). During your run, check your heart rate. At 70 percent of your max heart rate, about 50 percent of your fuel comes from carbohydrates. At 75-80 percent of your max, it increases to 65% carbohydrate. 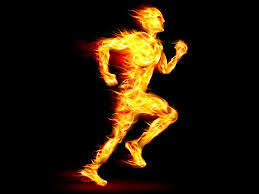 So a person who is 150 lbs, running at a 7 mph pace (8.5 min/mile) for one hour burns about 782 calories. If that puts the person at 70% heart rate that’s 391 calories from carbohydrate. At 75-80% heart rate that’s, 508 calories from carbohydrates. 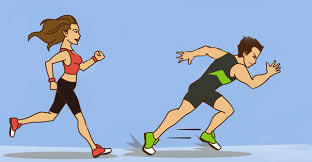 The same person running at a 5 mph pace (12min/mile) burns 544. Because they are going slower, the amount of calories coming from carbs is less and the amount coming from fats is more. The American Council on Exercise has a physical activity calorie counter that is based on your body weight, duration of exercise, and intensity. You can find it here. There are a bunch of different tools there to try out, if you’re curious. Once you know how many calories per hour you’re burning on average during your runs, you can begin to understand and build a strategy for resupplying your body with those calories. Your body cannot process enough food to be able to make up for the amount of calories lost through carbohydrate burn if you maintain a high intensity. The most you can hope to process per hour is about 352 calories. We’ll get into how to maximize that in the next post. 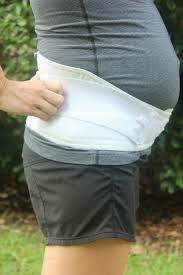 A maternity belt is going to be a must have for most running moms-to-be as they near the third trimester. Many women even with the support of a maternity belt decide to stop running during the third trimester because it becomes too uncomfortable. There is no shame in taking a brake during your last weeks of pregnancy ladies. Keep in mind a belly band and a maternity belt are different. If you’re running, a belly band isn’t going to help support your baby belly. The band allows you to continue to wear your pre pregnancy clothing for a longer time and delays the purchase of maternity clothing. It will cover your belly as your shirt creeps up and it will hold your pants up when you leave them unbuttoned and the zipper more and more down as baby grows. A maternity belt will help lift some of the baby belly weight up and distribute it more evenly across your back and hips. You can start wearing one whenever you want. I started wearing mine around week 27. I actually tried a bit before then, but found that my belly wasn’t big enough to make any difference. I should have bought a size small rather than a medium, which would have allowed me to wear it sooner. When you reach the third trimester, baby is about 2 pounds, still pretty small, but over the next 13 weeks baby will add on 4.5-5 pounds, and maybe a little more. Running with a medicine ball attached to your abs that increases in weight every week is tough. Many women begin to feel very tired and have round ligament pain as the uterus grows to its max height and baby’s weight increases. Pelvic pain can be problematic because the hormone relaxin is relaxing those tendons/ligaments holding your pelvis together. You can also have a feeling of increasing downward pressure (not time to exit yet kiddo), which is uncomfortable. I bought the Gabrialla belt after reading some reviews from other running mamas. Things you want to be aware of when selecting your belt are: first, washability. That thing is going to get sweaty and you’ll want to wash it pretty regularly. Second, regular washing, means you want it to be durable. The third thing to consider is breathability. Being pregnant generates a lot of extra heat, so wearing something around your middle that traps heat in, is not going to work. The Gabrialla goes around your low back and then under your belly. If you do it up too tight it can push on your bladder. You want it snug and comfortable. My daughter will kick and push at the belt before and after our run, but she is rocked to sleep while we are running. You can wear it over or under your clothing. I wore it over just because I didn’t want to risk any chafing. I’ve had a few women come and ask me about the maternity belt when I finish a workout at the gym and I’m always happy to help keep another mom-to-be active and happy.